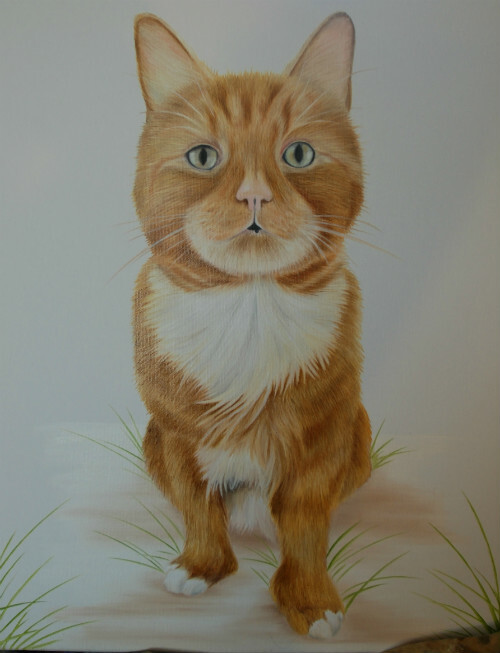 As most have you may have noticed my website is predominantly Dogs but I also equally love painting Cat portraits, this is why I was more than happy to paint the lovely James for his mum Natalie, sadly James has not long passed away so Natalie wanted a painting of him as a lasting memory, he was really part of the family and a wonderful pet. This isn't the first painting I have done for the lovely Natalie, I first painted her amazing dog Dixie and then her gorgeous fish, both paintings are now hung proudly in Natalies home soon to be joined by James. Although I enjoyed the painting it is always difficult to paint a pet that has passed away, I know as well as anyone how much of an impact a pet can have on your life so it's so difficult when they go, one nice thing for me though is that I can capture them in a painting that will last a life time.